I am beginning to think my husband is a closet vegetarian. If my son and his family are coming for a meal I always have to cook a vegetarian version of the recipe for my daughter-in-law. This time it was a chilli and I have to say, he admitted to it being outstanding. I like it so much I opted for the veggie version rather than the beef chilli myself! I always use canned red beans for my chillies, rinsing them under water as directed on the can before adding to my recipes. You can of course, cook red beans from dried yourself. Be careful, however, that these are cooked properly. Raw kidney beans contain lectin, a glycoprotein that can bind to sugars in membranes, causing changes in the membrane that lead to agglutination (clumping of cells) and mitosis (cell division). In the digestive tract, they bind to intestinal cells and block absorption. An episode of red bean poisoning lasts about four hours, beginning with nausea and severe vomiting and proceeding to diarrhea. Hospitalization is rarely necessary. The kidney bean lectin (phytohaemagglutinin) is destroyed by thorough boiling for about 10 minutes, after which water should be discarded and replaced before cooking. Red kidney beans are not appropriate for crock pot cooking. I found this recipe in my well used and trusted cookery book by Judith Wills -‘Top 200 Low Fat recipes’ and adapted it to my own tastes. It is so thick and unctuous you don’t miss the meat at all. Heat the oil in a large pan and sauté the onions and peppers over a medium heat for 5 minutes until softened and just turning brown. Add the garlic, chilli, coriander, cumin and chilli powder and stir for a couple of minutes. Add the remaining ingredients except the Tabasco and fresh coriander, mix well and bring to the boil. 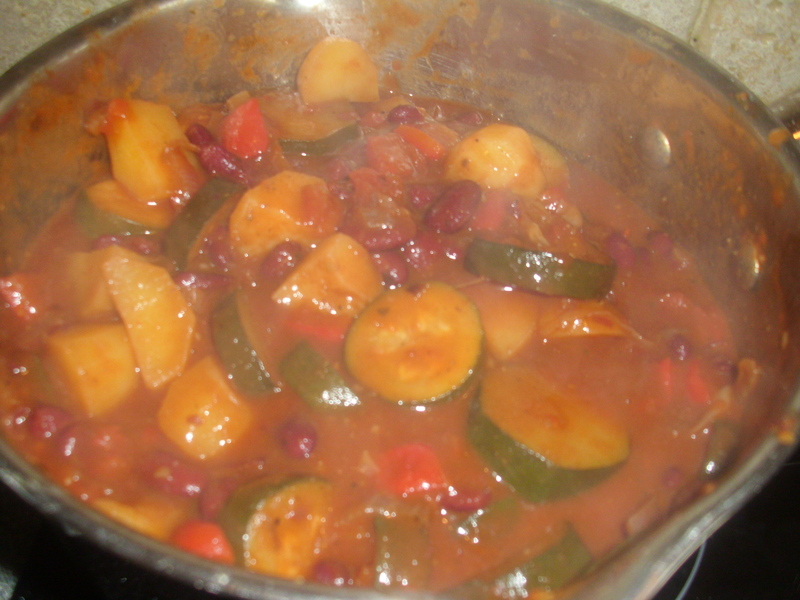 Reduce the heat, cover and simmer gently until the vegetables are tender. Half way through the cooking time test the chilli for heat. If you want it a bit hotter then add a little Tabasco sauce. When cooked, check the season and serve with the fresh coriander. I like to sprinkle mine with grated cheddar cheese. Perfect on rice or jacket potatoes.